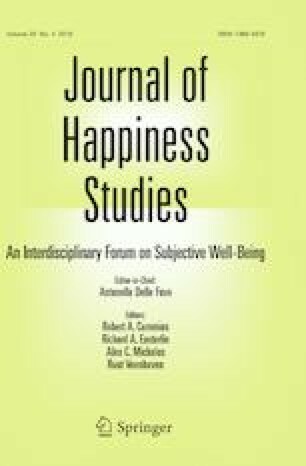 Past research has shown a negative relationship between time spent watching television (TV) and several indicators of hedonic well-being—including positive affect (PA). However, cross-sectional designs employed in most of these studies do not allow for inferences regarding the direction of the link between TV watching and PA. Present research aimed to address this gap by using daily diary data from a large national sample of U.S. adults (N = 1668, age = 33–83 years). Respondents reported time spent watching TV as well as PA for eight consecutive days. Results of multilevel modeling analyses showed that duration of TV watching on the previous day did not significantly predict changes in PA on the next day. However, PA on the previous day significantly predicted decreases in duration of TV watching the following day. The results held after controlling for factors known to predict duration of TV watching and PA (i.e., age, gender, income level, employment status, marital status, health status, and personality traits). The present research goes beyond past cross-sectional work by shedding light on the direction of the link between TV watching and PA. Our findings indicate that watching TV does not seem to diminish PA—as critics of TV proclaim—but individuals seem to watch TV to a greater extent whenever they experience reduced PA.
Bureau of Labor Statistics. (2015). Time spent in leisure activities in 2014, by gender, age and educational attainment. Retrieved from United States Department of Labor website: https://www.bls.gov/opub/ted/2015/time-spent-in-leisure-activities-in-2014-by-gender-age-and-educational-attainment.htm. Accessed 19 June 2017. Fazio, A. (1977). A concurrent validational study of the NCHS general well-being schedule. Vital and health statistics, series 2, no. 73. Washington, DC: U.S. Government Printing Office. Retrieved from http://www.cdc.gov/nchs/data/series/sr_02/sr02_073.pdf. Accessed 1 Feb 2018. OECD. (2016). Time use across the world. Retrieved from OECD website: https://www.oecd.org/gender/data/OECD_1564_TUSupdatePortal.xls. Accessed 19 June 2017. Thinkbox. (2013). Screen life: TV in demand. Retrieved from Thinkbox website: https://www.thinkbox.tv/Research/Thinkbox-research/Screen-Life-TV-in-demand. Accessed 10 Apr 2017.